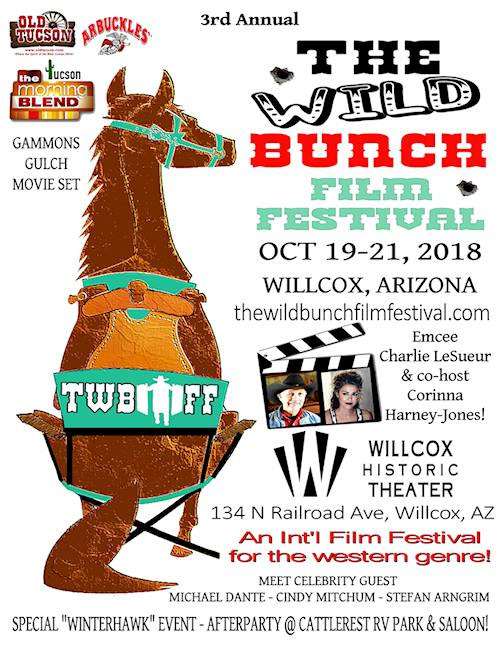 We are looking forward to a fabulous weekend at The Wild Bunch Film Festival in Wilcox, AZ Oct. 19-21, 2018. In just a few weeks, the Festival begins with western genre film submissions. On Saturday Oct. 20 at 6 PM there is a special screening of ‘Winterhawk’ starring Michael Dante in the title role. There will be a Question/Answer session after the showing and a book signing to follow. All the celebrities will be autographing and selling there photos and books throughout the weekend. It would do a Cowboy good to see y’all there to enjoy this special weekend and to support the actors and historians who are keeping the West alive! This event is in conjunction with The Wine Festival so it should be a good time for all! C’mon down and enjoy the fun! See you there!